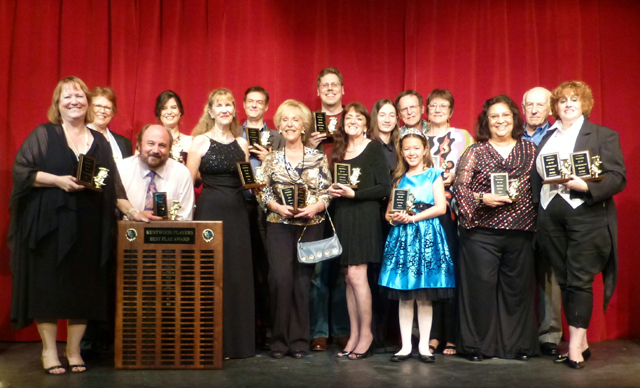 Congratulations to the 2012-2013 Season Marcom Masque Award Winners (from left) Susan Goldman Weisbarth, Jayne Hamil, Bradley Miller, Jennifer Sperry, Margie Bates, Mark Mayes, Gail Bernardi, Shawn K. Summerer, Joanna Churgin, Hollister Starrett, Fiona Okida (accepting for her father, Roy T. Okida), Jim Crawford, Sheridan Cole Crawford, Maria Cohen, Michael Cohen, Patricia Butler (also accepting for Karl Schott). The 2012-2013 Marcom Masque Awards Ceremony was held on Saturday, June 30, 2013 at the Westchester Playhouse. The event chairpersons were Shari Barrett and Linda Reinhardt, with Drew Fitzsimmons directing the entertainment portion of the event. Calia Mintzer-Wolf managed the guest list, and Michelle Rosen was the event’s Mistress of Ceremony. The annual event celebrates our six production season, and all Kentwood Players members in good standing who have seen all six productions cast their vote in several categories for our annual Marcom Masque Awards, named in honor of our founders Jan and Arky Marcom. Every performer, designer, producer, and director in all six productions are nominated in categories determined by the director and approved by the Board of Directors.